There’s a bit of magic behind every perfect party – thanks to the Little Sparkles! Jenny is having a garden party. There’s raspberry fizz to drink, chocolate-button sandwiches and fairy cakes to eat! But when her friends arrive, everything has been wrecked! Could this be the work of the naughty Party Poopers? Then a tinkling sound rises from under the picnic table. It’s the teeny-tiny Little Sparkles! 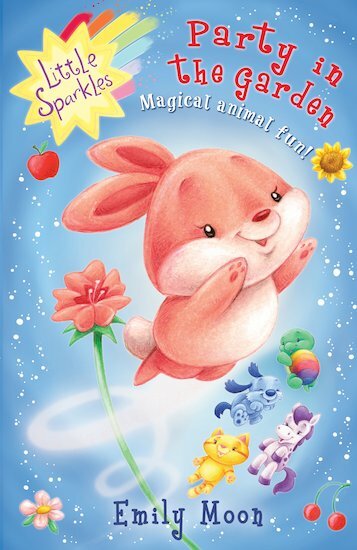 There’s Tikki the yellow kitten, Peppy the light-blue puppy, Bubbles the pink bunny, Princess the white pony and Tubbs the rainbow-coloured turtle. They’ve come to fix things with their magic glitter. And if they can make a Party Pooper have fun, he might just turn into a Little Sparkle too! By brother absolutely loves it.